Providing Bibles to people in their own language is a wonderful blessing. Doing so electronically can be easy, but also a death sentence. How can you deliver the Lord’s word to others so they can reproduce it themselves while limiting the risk that some might face by having a Bible. The ShofarBook project is an attempt to offer a self-replicating electronic Bible that is designed to protect the user as much as possible. How it is done and a call for your help is set before you. While in the West many have easy access to printed Bibles or have one or more on their shelf. In many parts of the world it is very different as possession of a Bible can be costly to your status, livelihood, or life. However, Bible smuggling continues and bringing printed Bibles to many parts of the world is done with passion and often at great risk. Electronic Bibles have some significant advantages while also having even greater risks. Internet based Bibles allow people access to the Scripture, but in many places in the world your access is monitored or limited. It is very easy for an authority to know who accesses online Bibles, when and from where. This can have a devastating impact on the individual and their family. Having an offline Bible, a program that runs on a desktop, notebook, tablet, or phone, can allow reading without as much tracking, but not completely. While the user may be using an offline program, if the device used has online access, the door remains open to tracking. This is a fairly simple process for a hacker, and common to mandated in many places in the world such that the state still knows you have the Bible, or even when and where you are using it. The costs can be high, from being disfavored or shunned, to beheading or involuntary organ harvesting. Can the user be protected? 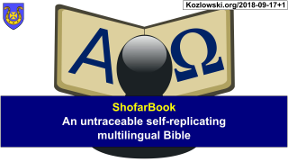 ShofarBook is an attempt at providing an electronic Bible that does not provide any communications services. It is a quiet read only device that can be simply reproduced by the user. Delivering one to a community allows the community to reproduce the Bible without outside help or tracking. ShofarBook can run like most programs on a desktop, notebook, tablet or cellphone. However in that mode it is open to being tracked. When ShofarBook is installed on a device where it takes full control, such that no other programs can run and there is no underlying operating system, the device becomes a standalone ShofarBook. It no longer has any ability to communicate with the outside world and no longer any ability for the outside world to find it. While it is fancy and cool to have a smartphone that can do so many things, it is foremost a tracking device that monitors you, what you say, where you are, what programs you have and when you run them. Turning off these features may seem inconvenient, but for some it is imperative. ShofarBook is also simple. In the standalone mode there are no options to allow for an error that may allow tracking. It is designed such that the novice won’t make mistakes, or the confident won’t overlook something. 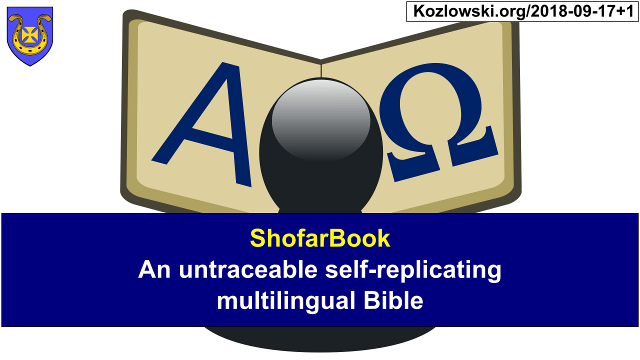 While printed Bibles require printers, the ShofarBook self-replicates. All that is required are other devices, new or used, fancy or cheap, that can be wiped clean and become a ShofarBook. If one person has ShofarBook in any form, by using a USB Flash drive or memory card, the program can be copied to the memory device. The program can then be copied to other computer devices, even those of a different type, and run as a normal program under the operating system or take over the device to make it solely a standalone ShofarBook. There is only one file and by itself it morphs into whatever is appropriate for the hosting device. Delivering one version, delivers all. A group of people can gather bringing their own devices or having them provided. The one copy can then be shared, and now all have a ShofarBook, and all have their own copies of the Bible in their own language. For some, being at a ShofarBook Party can be the start of a celebration that lasts for a lifetime. ShofarNexus is software designed for hyper-secure communications. It is the platform that can take control of the computer is runs on. It provides the underlying mechanics to allow for self-replication and running on a variety of devices. It also has the ability to turn off communications, a vital part of a standalone ShofarBook. 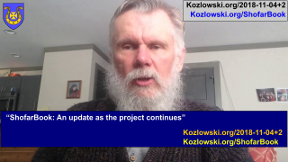 The ShofarNexus project, at least some of its essentials, needs to be completed to allow ShofarBook to come to life. Will you help?